Is preventing child working alone enough to reform ? Birth of child labour/ begger and child prostitute is due to lack of social security and unemployment of parents !!! NO mother likes her child to go for work !!! It is financial crisis which forces !!!!! Our understanding should be little more practical as no parents want their children work at the age when children are to study and play. 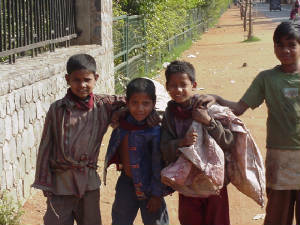 System of child labour prevails in the countries, which are poor or underdeveloped. Nearly 70% of world's poor live in Asia alone and major contribution made by China, India, Pakistan, Nepal, Afghanistan and Bangladesh. Where 75-80% of populations live in rural villages, have main employment in agriculture and small and cottage industries. Major percentage is illiterate or semi literate. In India alone around 40% of illiterates in total population of one billion.And 36% of the population are unemployed.This catagory is not able to find jobs in modern industries.Main traditional crafts manufacturing has almost collapsed due to lack of demand in international market has further aggravated unemployment crisis. International economy and industrilisation should be favourable.Vast gap of poor and rich counties need to pruned.More and more job opportunity based industries given priority. Exessive growth of population is major obstacle.Major program needed to prune this growth. Nearly 70% of the child prostitutes are from Africa and asia. When you grab a bar of chocolate, have you ever thought about who makes it? Does chocolate ever remind you a young child working from dawn to dusk?